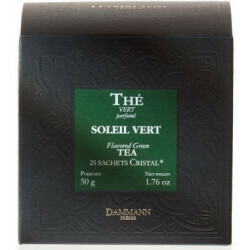 Bali is a premium Jasmine flavoured green tea from Dammann. Let your senses undertake the great journey with Dammann's Bali Tea. This premium tea is a blend of Sencha from China and Jasmine green tea. It unveils a surprising and exquisite taste of flower petals, litchi, grapefruit and rose. It may be just as well served hot or iced. An orange-flavoured Sencha green tea from China. Ingredients: green tea, Jasmine green tea, flower petals, flavourings (lychee, grapefruit, vineyard peach), Rose essential oil. Recommended steeping time: 4-5 minutes.